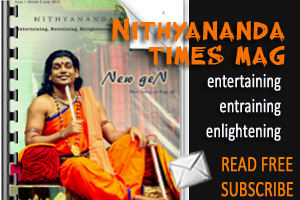 Home > Complete Nithyananda Nirahari > Nirahara is a Real Liberation from Sufferings! The craving is so much, I could not even wait on some auspicious days till the pooja is over. Before even offering naivedyam to the God, already I would have finished half of it. Such a kind of a person, now a Nirahari means, I myself could not believe it. It’s all finally because of the grace of Swamiji. It is so funny. 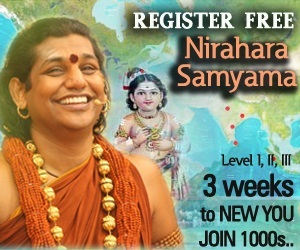 When I started my first Nirahara samyama in the very first batch, I could stay only for 1 and half a day without food. After that I was not able to control myself. I thought this kind of samyama is not for people like me. So I broke the samyama. 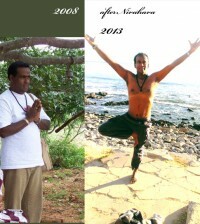 But, I was so inspired by seeing my husband and other sanga people successfully living Nirahara life style. Then I thought, when they are able to do, why not me. This time, again I participated in the third batch Nirahara Samyama. This time I could do it successfully without breaking it. 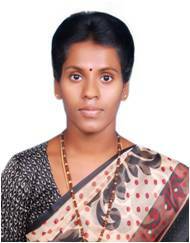 This gave me the courage to go for ‘The Samyama’ in Thiruvannamalai. First I thought, can I do it continuously for 21 days? But I wanted to experiment it. Finally by the Master’s grace, I could finish it successfully. This gave me again tremendous self-confidence. So for whatever I thought impossible for me was made possible for me. This helped me to break some of my mental patterns like ‘I can’t do it’, ‘I am a failure’ etc. After this samyama, once in a while very rarely I used to have some solid food. Means 90% Nirahara and 10% I used to have little food. Then I did The Samyama again in Dec’2012 Cruise Inner Awakening program in Singapore, from 8-12-12 to 29-12-12. During these 21 days itself I decided not to eat solid food any more in my life. So I am. It is really very big relief from dumping all junk food in our stomach and abusing it. Even in the liquid diet also, I avoid taking coffee, tea, cold drinks etc. So all the unnecessary fat and water left my body. Now I feel very light and lost more than 10KG. After the first The Samyama in Thiruvannamalai, I continuously took medical tests like Complete Blood test, Urine test, Lower abdomen test, ECG and some other special tests for 3 months. Every thing including my BMI level is also normal. 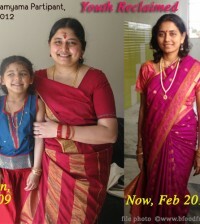 Health issues like stomach pain, indigestion problem, gas trouble, sore throat all disappeared. Now I am completely free from all these deceases, and able to do my daily routine with more energy and less sleep. Not only has my weight is reduced, but also considerable thought reduction happened in the psychological level. I am able to do Yoga flexibly and able to sit in mediation with the calm mind at least more than one hour in straight posture without moving the body. It is so beautiful to be in that space of experiencing peace within. The anger, irritation, simply yelling at others for no reason is reduced and awareness is increased. 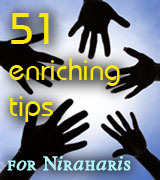 In the society, people are surprised to see me and my husband, living the Nirahara lifestyle. They all think, it is not an easy thing to do. Some say, this can be practiced only after retired life. They are even afraid to experiment it. They always look at us as an extraordinary people. But, we are going on counseling them, saying we were also like them only, before experimenting it and giving them the confidence to do Nirahara samyama. As we are not eating any solid food, our younger son who is just 5 ½ years old also understands the consequences of eating the junk food. So his nagging is also reduced drastically for it. When we tell our kids not eat junk food, but when we eat all those food, they don’t listen to us. But when we live and show them, they simply start picking up this life style from us. My elder son who is 13 years old now, is studying in Nithyananda Gurukul, Bidadi, Bangalore, India. He is also interested to do Nirahara samyama but he is not eligible for it as his age is under 18. But he completely avoids taking sugar contained products like biscuits, chocolates, sweets, cakes, cookies, etc. He also avoids food which has onion, garlic, chilly. Eating only satvic food, made not only his body healthy, but also his mind. He became broad-minded because the food what we take is directly associated with the way we think. 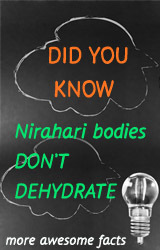 So as a parent being a Nirahari, I feel very satisfied to show the right and healthy life style to my kids. As my husband is also a Nirahari, it is easy for me to cook only liquid food. I need not to break my head to prepare every day menu because now a days, he also started preparing different verities and combinations of simple soups and (raw) liquids. So both of us have become creative in experimenting new, new recipes and enjoying cooking together and having it together. It’s really a liberation for women from cooking all complicated recipes using all sorts of grinding masalas. So we are very grateful to our Master Paramahamsa Nithyananda for guiding us in a right path and making us to explore our hidden possibilities so effortlessly by awakening our biomemories. Whoever is reading this testimonial, I kindly request them not come to any conclusion without experimenting on Nirahara samyama. Just try it once. If it is not possible for you, you can break the Nirahara samyama at any point of time. But if you can make it successfully, it is a real liberation from many of our sufferings in our day-to-day life. Do not give up this Nirahara Samyama till you are successful.